You will discover in the information packed video what you need to change in your set-up, execution, and delivery to make spey lines work for you. You will discover in the information packed video what you need to change in your set-up, execution, and delivery to make these lines work for you. You will receive detailed lessons on five different casts: Switch Cast, Snake Roll, Change of Direction, Circle, and Double Spey. Cutting and configuring shooting head and skagit belly speylines is no easy task. 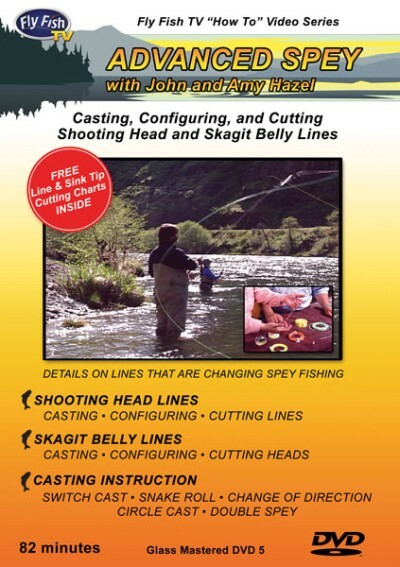 John & Amy Hazel will show you how to weigh and cut your shooting head line so that it will exactly match your rod, how to cut your sink tips for skagit belly lines to make them fish perfectly! 82 minutes in length. Another great Fly Fish TV video on DVD!